Through the night and deep into the day, the crackling fire raged, sweeping through apartments and destroying lives like an out-of-control inferno from an earlier century, or perhaps from a less affluent part of the world. But this was London. This was 2017. And Wednesday's fire was unlike any seen here in recent memory, a blaze that transformed a 24-story high-rise that was once home to about 500 people into a charred ruin on the city's otherwise gleaming skyline. The fire marked a fresh trauma in a city already roiled by terrorist attacks, an unhappy and divisive political campaign, and the lingering uncertainty over Brexit, all of which seemed to endow the tragedy with an extra measure of dismay. But it was also, residents of the Grenfell Tower public housing development bitterly said, the specific and predictable result of years of warnings that had gone unheeded, an emblem of a city that is neglecting its most vulnerable residents even as it increasingly caters to the whims of the ultra-rich. 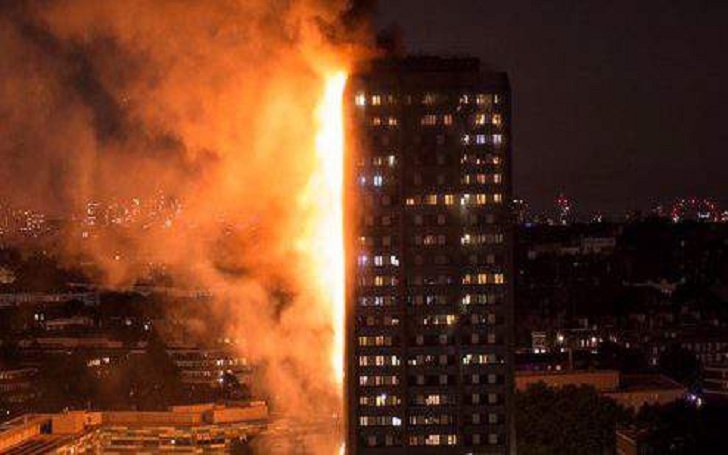 In one of the wealthiest neighborhoods of London - a short amble from the homes of celebrities and royals - people living in one of the city's increasingly in-demand havens of affordable housing jumped from 20 floors up after being trapped by the advancing flames. Children banged on closed windows as they were enveloped by the thick black smoke. A woman dropped her baby, desperately hoping someone would catch the infant in the street below. By early evening, police said that 12 people had died and more than 70 had been injured. But with many people still unaccounted for, authorities said the toll was almost certain to rise. The scenes of a skyscraper engulfed in flames on a picture-perfect, blue-sky day evoked memories of New York in September 2001. But there was no reason to think terrorism was a factor, authorities said. 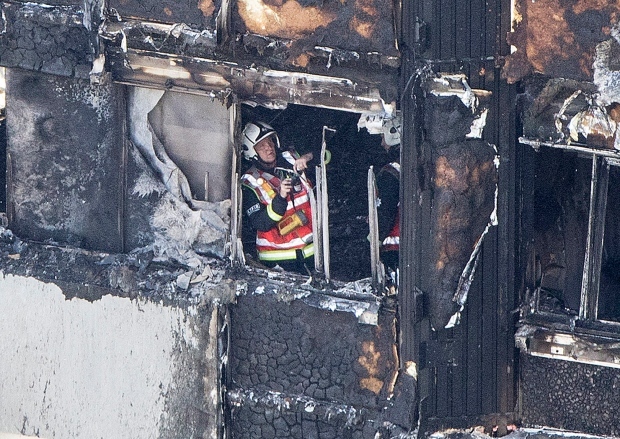 The investigation, they said, would take time to assess what officials hinted could amount to a series of failures that, together, amounted to what London Fire Commissioner Dany Cotton described as "an unprecedented incident." 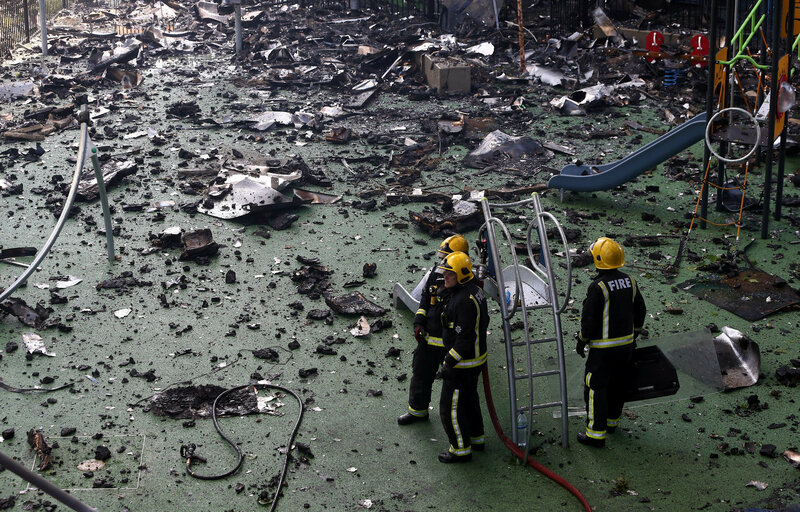 At least 40 fire engines responded to the scene, where 200 firefighters waged a futile battle to contain the blaze. As fiery debris rained from above, they raced into the building wearing breathing tanks and searched floor by floor for survivors even amid concerns that the structure could collapse. Outside, residents who had survived praised the firefighters but blamed the fire on official neglect. They said they had repeatedly raised fire safety concerns, which they said included the building's inadequate escape routes, the absence of an integrated alarm system and a renovation last year that they worried had left their building clad in panels that were shiny and new but not up to code. The Web page of the Grenfell Action Group, a residents' organization, testified to the long-standing concerns, with blog entries stretching back years that warned of the dangers. "All our warnings fell on deaf ears," the group said in a post added Wednesday morning, hours after the fire broke out. "We predicted that a catastrophe like this was inevitable and just a matter of time." The target of the group's ire - the Kensington and Chelsea Tenant Management Organization, which runs public housing in the area on behalf of the local council - issued a statement late in the afternoon in which it acknowledged that residents had earlier raised concerns and vowed to "co-operate fully with all the relevant authorities in order to ascertain the cause of this tragedy." Although officials would not speculate, experts said Wednesday that their focus was on the building's exterior cladding, which is supposed to be fireproof but which witnesses said had burned like paper, quickly transmitting the fire from unit to unit and from floor to floor. 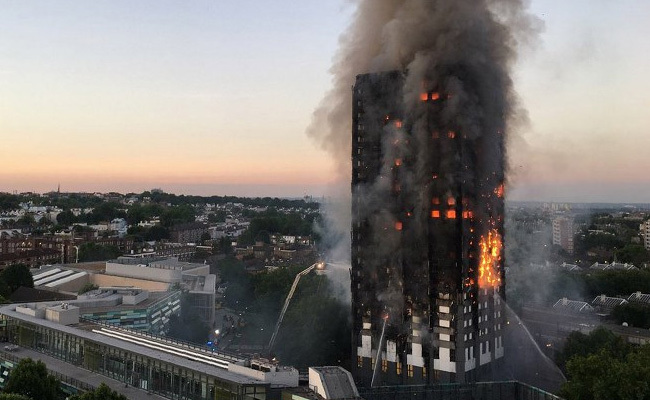 Law said that British regulations are intended to halt the spread of fire between units and floors in high-rise buildings, but that when that fails, "the consequences are often catastrophic." 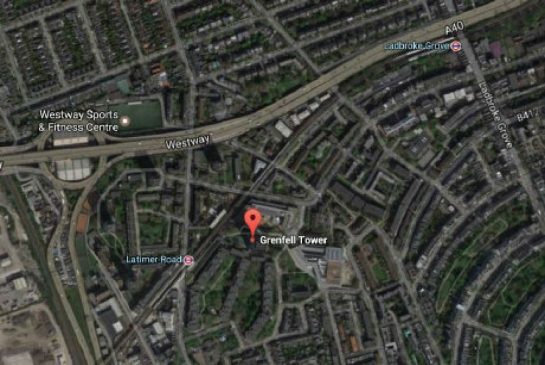 Grenfell Tower, built in 1974, contained 120 units of publicly subsidized housing, with low-income and disabled residents given priority. It was one among a cluster of high-rises that stick out from the northern tip of leafy and stately Kensington, marking an unofficial western entry point to central London. Experts said firefighters should have had time to extinguish the blaze before it spread to other units. 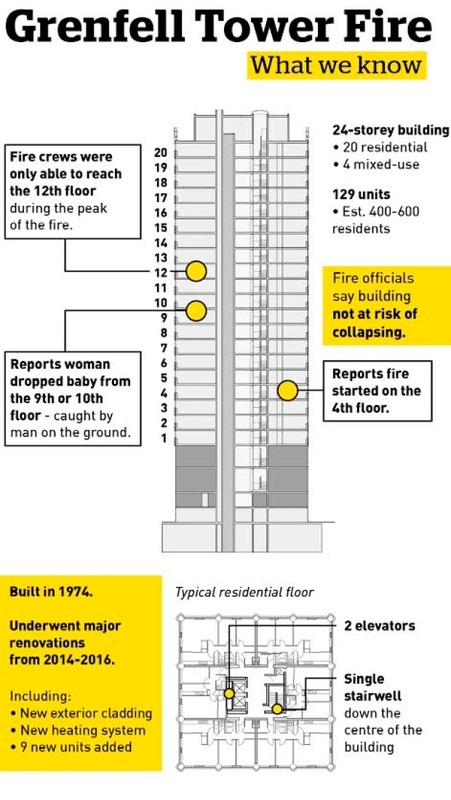 Instead, it leapt within minutes to other floors - but somehow never triggered any building-wide alarms. Hundreds of residents, many of whom were asleep when the blaze broke out, were forced to flee over the coming hours down a cramped, dark and smoky stairwell - the building's only escape route.